I’ve always really enjoyed Lao Tzu and the Tao Te Ching. This quote in particular really speaks to me right now because I’m so worried about my future. I’m currently in a situation I don’t want to be in and I am trying desperately to change it. Over the weekend, I applied to nearly 30 jobs. I really hope I get some interviews soon because I’m not sure how much longer I can deal with being absolutely miserable at work. I have so many dreams and so much ambition, but I constantly feel like I’m going to end up stuck in some awful, dead-end job. It’s been impossible to find a full-time job at all, let alone one in my field. Here’s to hoping that something works out. What are some quotes that speak to you? 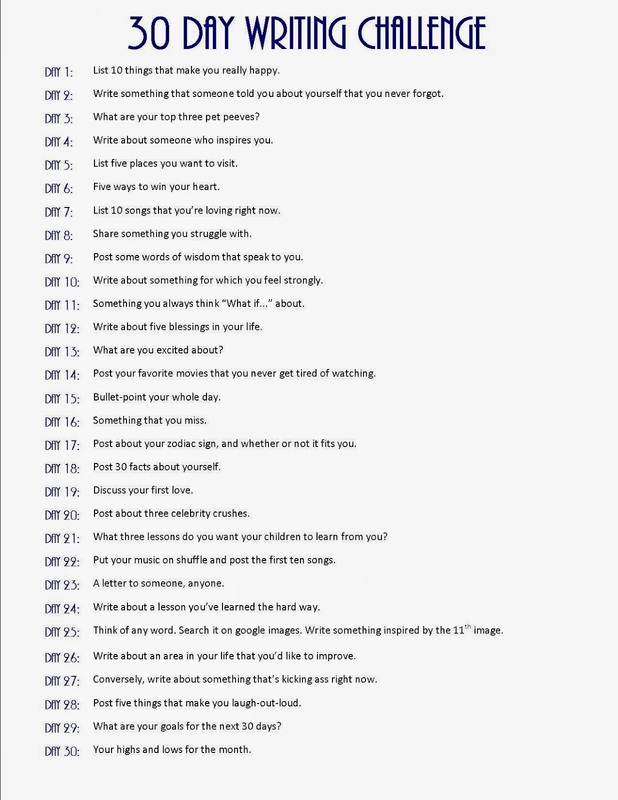 Also, if anyone would like to do this challenge with me, it can be found here. Something I struggle with is anxiety and it affects me on a regular basis. Over the years, I’ve held a number of different jobs and, while my tasks have changed, my response to stressful situations has not. As a server, I can feel very overwhelmed. This happens when I either have a large party or many tables at once. If I feel rushed or if I’ve forgotten something or if things simply aren’t going smoothly, I can’t help but burst into tears. I have to completely remove myself from the situation and I end up in the back or locked in the bathroom. At 25 years old, this is incredibly embarrassing. People will tell me to grow up or not to let it bother me. But it isn’t that simple. Rationally, I know it’s ridiculous to get upset over the fact that it took me two more minutes to bring a guest their Pepsi, but in that moment it feels like the end of the world to me. My eyes fill with tears and it becomes physically difficult to breathe. I wish I knew how to keep this from happening, but I don’t. I’ve tried yoga. I’ve tried breathing exercises and meditation. But nothing seems to work. What’s something you struggle with? What’s your coping mechanism? As many of you know, I’m currently waiting tables while I look for something more permanent. It’s not the best job right now, but it’s something. I’d like to share a few things with you guys. Especially if you’ve never worked in food service before. Most servers make around $2.34 hourly (that’s actually what I make). This means we live off of our tips. Literally. Maybe tipping 15% was acceptable 20 years ago, but it’s really rather insulting today. If you can afford to go out to eat, you should be tipping your server at least 18%, if not 20%. We are on our feet all day, running around to make sure that you have a wonderful dining experience. I do not get a break during my shift, even if I work a double. If it’s busy and I order food, I usually have to wait at least 30 minutes to take my first bite and then periodically nibble while I check on my tables. Today, I had a $117 table and a $70 table both stiff me completely. That is not okay. I went home with $40 in my pocket when it should have been closer to $75. This is the money that is paying my loans, my car insurance, putting gas in my car, and any other expenses I may have right now. Some days, I actually go home with less than that. When you stiff a server, you are the person we talk about negatively for the rest of our shift. While this job will not be my career, it is for many others. People with families and expenses just like you. In America, we tip our servers. If you’d prefer not to, we’d prefer if you stayed home and cooked for yourself. Does anyone have any server stories to share? Take long walks with me. Sing with me (loudly and badly). Embrace my silliness/weirdness and don’t be afraid to be silly/weird, too. I was supposed to write this post yesterday, but I honestly had a difficult time with the topic. I don’t recall a time in my life that I’ve ever had a “role model” or someone I necessarily looked up to. Of course there have been people who have helped me to become the person I am today (my mother, my teachers, my friends). However, I wouldn’t necessarily put any one individual on a pedestal. So, instead of writing about someone who inspires me, I’m going to write about something that inspires me. Anyone who knows me knows that my life pretty much revolves around music. I listen to music every chance I get: alone in my room, driving in my car. Wherever. Whenever. It has the ability to completely alter my mood and it is something that I crave. I spent four years in college as a radio DJ and, during that time, I was introduced to so many new artists and genres. I had the opportunity to interview some of my favorite musicians and attend numerous concerts that I will remember for the rest of my life. I also have friends who have referred to me as a human jukebox because I will burst out into song if I hear something at a bar or in a store. My tastes are not limited to any one particular style and I truly believe that this is something that has helped me to become a more well-rounded individual. I’m going to go out on a limb and say that almost everyone likes some form of music. Therefore, I feel like I can relate to a range of different people because of it. My mom raised me on classic rock. I played cello in an orchestra from elementary school through college. The radio station I worked for played all heavy metal all the time. Pop music. Hip hop. Electronica. I like it all. Well, except maybe country. But there you have it. Music is my inspiration.